A hidden gem in the middle of Canggu rice fields, our villas offer a total tranquil hideaway from busy daily life. Casa Margarita & La Casita is a five-bedroom lodging nestled on a site of green rice fields in Tiying Tutul village in Canggu. Our Bali holiday home actually consists of two separate villas, the 3-bedroom Casa Margarita and 2-bedroom La Casita. 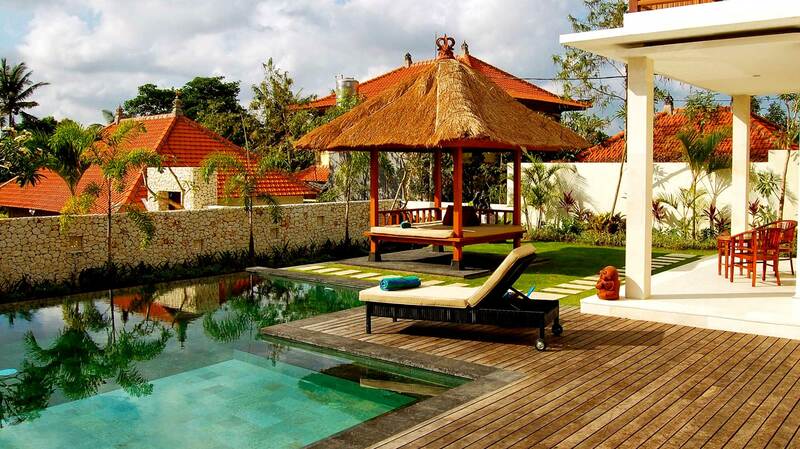 The villas were built using a mix of modern and Balinese style interior and exterior. The 3-bedroom Casa Margarita offers two king-size bedrooms with ensuite shower and toilet on the ground floor, and one Master bedroom on the second floor with ensuite bath tub, shower, and toilet. The 2-bedroom La Casita has two king-size bedrooms with ensuite shower and toilet. Both Villas feature an open space kitchen and living room facing the swimming pool, where breakfast prepared and served daily. An open air shower next to the swimming pool, Balinese gazebo, and a barbecue facility are available to complete your vacation. In addition to the villas, a well-maintained tropical green garden, fresh breeze from the surrounding rice fields, and sounds of nature will always accompany our guests' relaxing time at our villas. Our villa is managed by a local professional hospitality team. Don’t hesitate to send us an inquiry and our friendly team will be ready to assist you. We assure every guest will be handled with a high-quality standard of hospitality. We hope that you will find your vacation a once-in-a-lifetime experience every time with Casa Margarita & La Casita, Canggu - BALI! Check out our Facilities page to learn more! © 2016 Casa Margarita Bali. All rights reserved.